To begin this issue, we are introduced to a woman named Angela Ramirez, who has a happy perfect life. You know who else has a happy perfect life? Barbara Gordon that's who. Barbara is awoken by the promise of bacon, and jumps out of bed to have breakfast with her father Commissioner Gordon. Her mother's out shopping, and James Jr. is out helping the homeless. A brother who isn't a psychopath, a mother who didn't run out on her, and bacon. Yup pretty perfect. Only thing that could make it any better is to swing through Gotham, as her alter ego Bluebell. 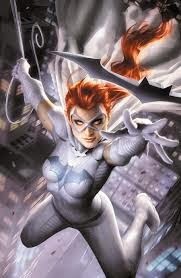 Now this is the fun loving Batgirl I've been missing, only problem is, it isn't my Batgirl. I can never win, but let's continue. At the Joker Ice Cream factory, Angela Ramirez, (being a high up at the company) is getting all her work taken care of, so she can give a tour of the factory to a school's field trip. Please tell me if any of you in interwebs land, ever had a field trip to a ice cream company? That would be ridiculously awesome! All I got was the lousy educational trips, but I did get a sweet set of Star Wars figures from the Baltimore Aquarium once. But there sure as hell wasn't any free ice cream. Nonsense. So Bluebell is out, and patrolling the city, when she is joined by a friend, Daybreak (Knightfall). As the two are joking around, they hear a scream in the distance. When they go to investigate they find that a boy was killed by the ice cream he had eaten. Bluebell looks around, and sees Joker Ice Cream trucks all over, and apparently their radios are down for service, so there is no way to contact the rest of the trucks to stop selling ice cream. Bluebell decides to go to the source, and sends Daybreak to get the police involved. Back at the Joker Ice Cream factory, Angela Ramirez takes the children into her office, and kills her assistant. She then puts on a homemade clown mask, and tells the children that she won't let anything happen to them, and that they will be a family forever. She also tells them to call her Mother Mercy. Mother Mercy tells the children how she was married, and had a little girl, but one day they went out to the movies while she had the flu, and then she got a call from the police later to identify the bodies. A man had killed them, and her whole life was gone, but she was happy, everyone was happy. Her family was dead, and all she felt was joy. She tried to forget about them, but every time she looked at the Joker Ice Cream symbol, it reminded her of what happened to them. She tells the children that she doesn't want to be alone anymore, and they're all going to sit down together and eat some ice cream. Oh man this is so good. Bluebell crashes through the window of Mother Mercy's office, because she didn't agree with the police using a sniper with all the children around. The two tussle, and when Bluebell looks at the Joker symbol, she remembers all of her time as Batgirl in the Death of the Family story arc. Even though Bluebell understands what Mother Mercy is going through now, it's too late. A sniper bullet enters the office, and kills Mother Mercy. In the end Bluebell holds onto Mother Mercy as she dies, and tries to put the memory away, because it's too hard to face, and wants the world to be the way it is. It's kind of sad how much I love this issue. I has everything I want in a Batgirl title, a fun loving capable hero, with a grim dark story. The only problem is it takes place in a dream world, and I'm afraid that it will have no bearing on future issues. But my fears aside, this was a fantastic issue, and would recommend it to anyone, who has an appreciation for good stories. By far my favorite issue of the new year, and I hope it continues in this fashion, dream worlds aside.